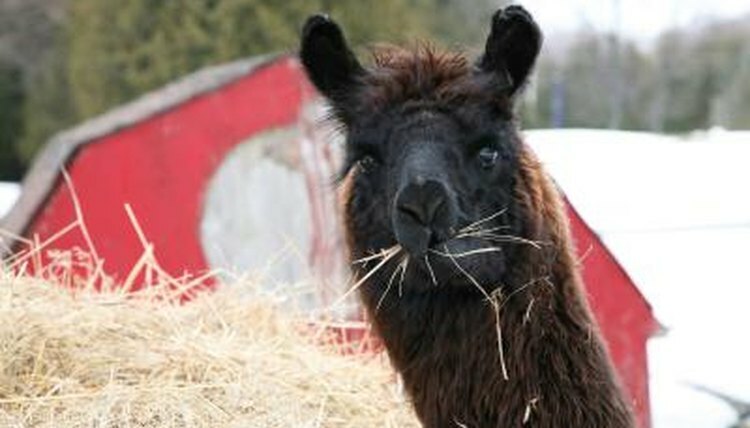 Alpacas are hardy animals bred for their warm, soft wool. Originally from the Andes Mountains of South America, they're used to dry summers and cold winters. In humid climates, they may get sick or have trouble breeding. Keeping track of the heat and humidity in your area can help you determine the best time to shear your alpacas to keep them comfortable and healthy. Shear your alpacas each year in the spring. This schedule allows them to have short wool in the summer heat and long wool through the winter. Consider the heat and humidity in your area to determine the best time in spring to shear. If your area is typically very hot in April, schedule your shearing early. If you need to hire professional shearers, plan ahead, as other customers will be scheduling their shearing at the same time. The shearing schedule is based on how well your alpacas handle the weather. They do well in moderate dry heat and extreme cold because that's the typical weather in the Andes Mountains, but alpacas now live all over the globe. They can be found in both northern and southern hemispheres, on continents like North America, Australia, and Europe. In areas with humid summers and rainy winters, shearing in spring helps the alpaca regulate her temperature. Like us, alpacas rely on sweat to cool down in high heat. Even if you have just sheared your alpacas, their sweat won't evaporate well when the air is humid. That can leave your alpacas at risk of overheating. To determine this risk, add the forecast temperature and humidity percentage. For example, a forecast temperature of 90 degrees and a humidity level of 45 percent gives you a heat index of 135. Your alpacas may overheat at a heat index above 120. Shearing in spring gives your alpacas time to grow their wool back for the winter. An alpaca’s wool keeps her warm and protects her from the wind, so you want her to have a long, luxurious coat when winter comes. The wool fibers are semi-hollow and trap heat close to the body. They also pull moisture away from the body, keeping the animals dry and warm. Sarah Albert has been a writer and editor since 2003. She produced a workbook for the Shenandoah Women's Center and also enjoys covering animals. Albert holds a B.A. in English and a B.S. in animal behavior.